In the beginning, there were only the elemental forces of fire, water, earth and wind. Click here to play! These four powers were chaotic and worked fiercely against one another, only to eventually give life to powerful creatures called Elementals. Each of these Elementals was bound to a particular element, and could manipulate that force of nature at will. After many years of pointless destruction, some of the Elementals put aside their differences and began making new creatures. The fire and earth Elementals worked together to make salamanders, while the water and air Elementals created seagulls, pelicans and thousands of other water birds. Eventually, a group of all the kinds of Elementals banded together to create their masterpiece - humankind. You are the greatest of the humans they have created and you must put a stop to the wars of the Elementals. With intelligence and wit, as well as a touch of all the elemental forces combined, humans are the best suited to harnessing and controlling the elemental forces, to turn them toward better purposes than petty squabbling. Bring order to the chaos in the Elementals slots, and maybe the universe will carve you a jackpot from the maelstrom of the slot reels. 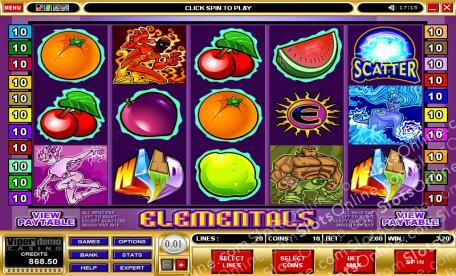 The Lightning Ball symbol is the scatter symbol in the Elementals slots, paying out on the total bet when enough scatter symbols land on the reels. 2 symbols payout the same amount as the total bet, 3 symbols payout 2 times the bet, 4 symbols payout 15 times the bet, and 5 symbols payout 200 times the total bet. The WILD symbol substitutes for all symbols other than the scatter or bonus symbols, and it doubles the prize amount on combinations that it substitutes in. The bonus is triggered when the Elementals Logo symbol is scattered on reels 1 and 5. The bonus is 20 free spins with a 2 times win multiplier. Also, a gamble feature is available. In it, a win on the reels is wagered against correctly guessing the color of a playing card. Up to twice the amount wagered is won on a correct guess, but an incorrect guess loses the stake.